Octopuses and other cephalopods are well-known for their exceptional intelligence and complex brains, which appear to outstrip all other invertebrates’. But, they work within one strange constraint – like all other molluscs (snails, slugs, oysters and more), the nerve ring at the centre of their nervous system encircles the oesophagus. In cephalopods, this nerve ring has become enlarged and organised to form their advanced brain, meaning that everything they eat must pass through the brain. One would think this exposes the animals to significant risk of brain injury in the case they ingest something large or awkward. But cephalopods have a bird-like beak which crushes food into manageable pieces and minimises this risk. This section through a young octopus shows the bulbous, stripy-looking brain between the two advanced camera eyes, surrounding part of the oesophagus (small white centre towards the base of the eyes). Also visible are two of the characteristic arms, with multiple suckers and thick nerves running through them. The strange and seemingly precarious arrangement of the brain and oesophagus are a great example of evolutionary constraint dictating the state of a newly evolved structure based on a simpler, older one..
EDIT: To clarify, this bit is the brain! 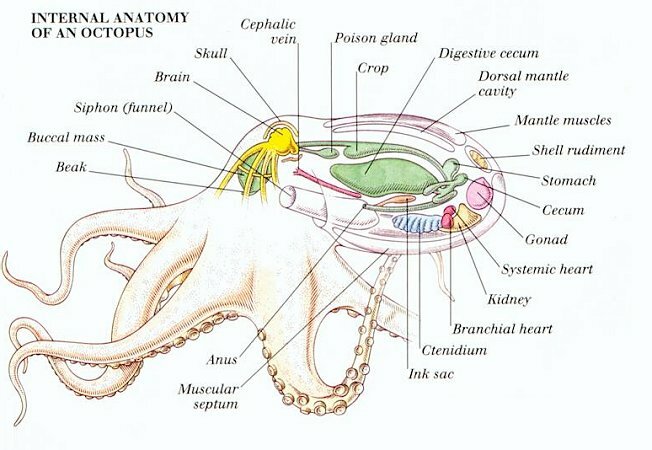 For a mini-map of octopus anatomy, please see here. Image courtesy of LHSR and the Smithsonian Museum of Natural History. Reblogged this on R. Harrison, Author.